This post presents some evidence to back up my quick take view on the context of China’s property put, published in the China Economic Review. Here’s a quote from a Marketwatch report in October 2014, one month before China’s recent cycle of interest rate cuts commenced. A year later the mortgage downpayment requirement for second homes was down to 30%. The high downpayment requirements were previously cited by government officials in 2014 as a reason not to worry about Chinese household negative equity risk in case of price falls. That defence now appears weaker. The same 2014 report also highlights how Ping An, one of China’s largest financial firms, had just launched its loans for downpayments business. The combination of reductions in downpayment requirements, policy interest rates, and developer subsidies, meant borrowing the remainder for the initial downpayment was within reach for more homebuyers, enabling them to leverage up further. “The developer said the lending is interest-free for a year as long as I have sufficient collateral to guarantee,” she said. “It helps me fix a temporary funding shortage. Yes, this is the same business that recently hit the news with HomeLink providing high-interest loans for downpayment, and in many cases, not requesting loan collateral. Perhaps after 18 months they were running out of high quality borrowers. “”It’s very dangerous to raise leverage in the housing market, especially when home prices start to fall,” said Yao Wei, an economist at Société Générale SA. Buyers with little or no equity in their homes can wind up owing more than a property is worth, making it difficult to sell if they find themselves unable to meet their mortgage payments as the market weakens. That was the warning from 2014, but one which assumes prices will fall (more on that later). Recent media reports create the impression this is local investors gaming the system, but then who would benefit from this rush of highly leveraged homebuyers? A government and property industry trying anything to reduce the massive stock of housing. Indeed, and so do zero downpayment mortgages. Now that prices have rebounded in first tier cities at least, the authorities are stepping in to curb the downpayment loans business. Job done, just don’t worry about the leverage. Here’s what the Chinese government juicing of the monetary system did for the mortgage business. The below data is compiled from the People’s Bank of China website, specifically, the monthly new loans and M2 growth reports, which includes the item ‘Household Medium to Long Term Loans’, showing the incremental new mortgage amounts each month. New mortgages have risen steadily since early last year, by January 2016 reaching almost half a trillion yuan, double the previous years average. 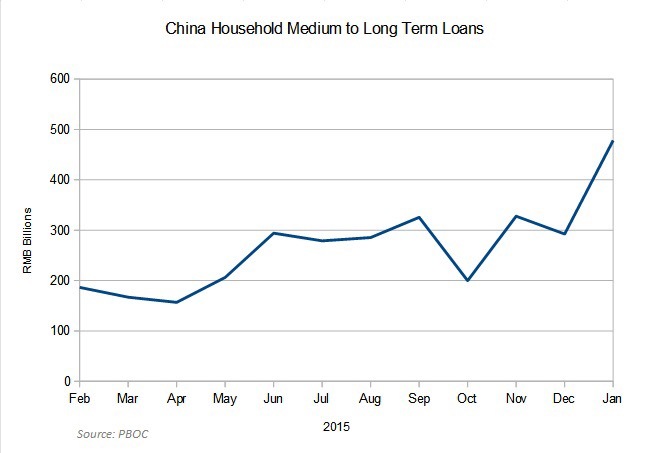 Overall mortgage issuance for 2015 was nearly a trillion yuan higher than 2014, at 3.05 trillion yuan. Strange that in 2015, China added half a trillion dollars worth of new household debt tied to a property market which is suffering from chronic oversupply. Data from the National Bureau of Statistics shows nationwide the total area of commercial housing available for sale exceeded 7 trillion square metres by the end of 2015, a new record. The situation is less severe in major cities such as Shanghai and Shenzhen, but still, why would the house prices not fall by more, or just crash, if it meant boosting sales and homeownership? With high downpayment requirements no longer protecting homebuyers, the last line of defence is property prices. In a normal free market, prices will fall to where demand can meet supply, but in China’s ‘social market economy’, things work a little differently. Local media reports last year indicated that Chinese property developers have been keen to reduce property prices to boost sales, but the government will not allow it! “When the market is bad, local government’s will not allow real estate developers to cut prices, this is no different than allowing the developers to commit suicide”. “With the real economy slowing, local governments are ever more reliant on land revenues, so the real estate industry is especially important in propping up the economy”. That was Centaline Property market research department head Zhang Dawei explaining in the same article why China’s property market is not so much a demand supply problem, but more a game of chess being played between self-interest groups, comprised of local governments, developers, speculators and genuine house buyers. You can guess group which one gets screwed in this game of keeping prices artificially high. Even before the properties have been built, local governments jack up the land prices each year through land auctions. The increasingly expensive land is then bought by capital rich central SOEs, with exemplary government connections. There is another reason, and another self interest group, that will not let property prices fall…China’s state owned banks. In China the main source of collateral is property, and this is generally pledged to the large commercial banks. That way the firm can enjoy a loan rate just above policy rates, and the bank is secure as long as prices remain steady. The last thing the banks want to do is admit their collateral is actually just a pile of cement collecting dust somewhere in a ghost town, and be forced to downgrade the value. Apart from lending to real estate developers, and doling out more mortgages, what could Chinese state owned banks do to help prop up their collateral prices and keep everything looking rosy? Well they could lend to homebuyers needing loans for downpayment but that would be illegal. So instead the banks invest in asset backed securities (ABS), the assets in this case being downpayment loans to homebuyers. In this article, some of the Chinese bankers interviewed deny there is any bank involvement in this business, as its ‘too risky’. Whilst some others are happy to explain how it works, even admitting there are other channels outside of ABS, such as buying up the loans, or beneficial rights. 21st Century Business Herald discovers that the main channel for bank wealth management products to enter the downpayment loans business is via private placement ABS or lease financing. (Article not to be copied without permission, please kindly inform the site by email thanks).